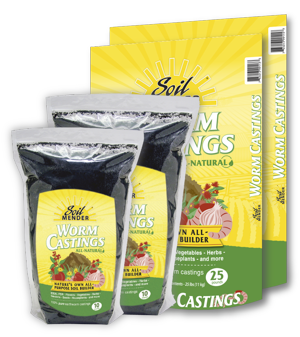 Soil Mender Worm Castings are one of the highest quality worm castings available today. Unlike castings made from worms that consume strictly garbage, paper, and other waste products, these are from worms that feast on a banquet of five manures, peanut hulls, oak leaves, humate, and more. This creates an excellent casting. Soil Mender Worm Castings are great for potting, planting, and general soil enhancement. This product will not burn or harm your plants.